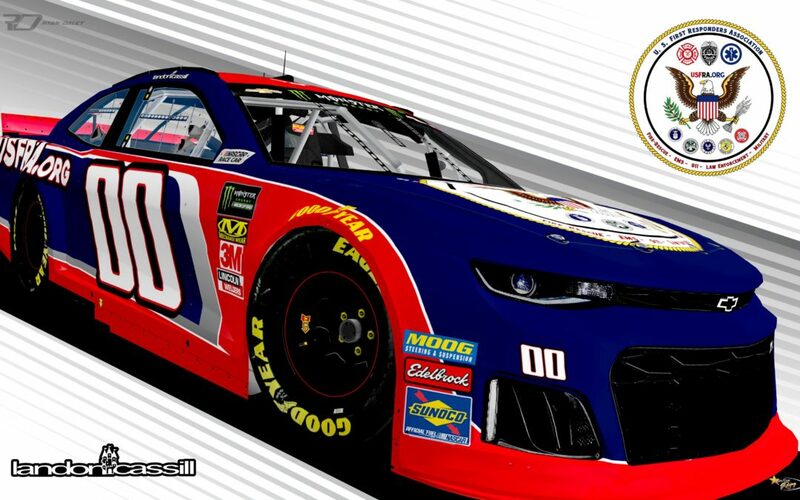 (SALISBURY, NC – 3/26/2019)—StarCom Racing, the U.S. First Responders Association (USFRA), and NASCAR Driver Landon Cassill partner up again for the O’Reilly Auto Parts 500 at Texas Motor Speedway to honor our first responders. We are pleased to announce the 2019 Hometown Hero for Dallas/Fort Worth is Mike Drivdahl, Engineer, Firefighter and Public Information Officer for Fort Worth Fire Department. Drivahl is also President of the Fort Worth Firefighter Charities and former Director of Fort Worth Professional Firefighters Association (IAFF Local 440). StarCom Racing’s Hometown Hero program helps bring awareness to the efforts of our nation’s first responders and recognizes one responder that has gone above and beyond the call of duty. The Fort Worth Fire Department serves over 875,000 citizens with 43 stations and 925 firefighters. In addition to Drivdahl’s daily job as spokesman and fireman for FWFD, Mike Drivdahl is also very involved and engaged with multiple child safety initiatives and community trainings across the city through FWFD and Fort Worth Firefighter Charities. Drivdahl and his guest will receive complimentary NASCAR VIP Hot Passes for the O’Reilly Auto Parts 500 on March 31. They will also enjoy SCR’s hospitality package, which includes food and drinks, pit tours, all access to the pit and garage area and a meet-and-greet with Driver Landon Cassill. To learn more about StarCom Racing, follow the team on Facebook, Instagram, Twitter & Snapchat @StarComRacing. The United States First Responders Association (USFRA) is a non-profit, professional and social network of fire, EMS, rescue, law enforcement and military personnel, as well as civilian support teams. USFRA brings together professionals from many diverse fields to strengthen safety initiatives, share knowledge and expertise, develop enhanced training programs, and combine efforts to maximize community outreach. A new 2019 initiative is USFRA’s book program designed to get custom preparedness and first aid manuals out to communities across the nation to educate the public, help lessen the burden on responders, and save people money on everyday items and services, with Dallas-Fort Worth area being the inaugural project. Like USFRA on Facebook and Twitter and learn more at www.usfra.org. StarCom Racing, a Monster Energy NASCAR Cup Series Team, based in North Carolina was launched in September 2017. SCR purchased a Charter and will run a full schedule for 2019. SCR was formed by a collective group of seasoned NASCAR specialists, as well as successful business entrepreneurs from SCR’s parent company, StarCom Fiber. For any sponsorship opportunities, please reach out directly to our Marketing Director, Elyshia Cope at ecope@starcomracing.com. More Horse Power! Mane ‘n Tail!